Pack some power with these handy USB gadgets. USB is a major technology success story. It has proliferated across a huge variety of prod-ucts, from digital cameras to printers to portable gadgets. You can buy USB-powered personal fans, mug warmers, and even a USB desktop fondue pot. 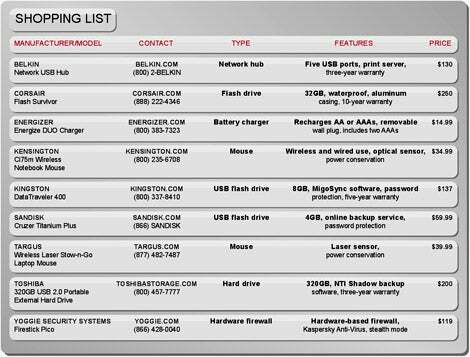 But we'll focus on devices with more useful business applications like hubs, hard drives, flash drives and peripherals. The $130 Belkin Network USB Hub isn't your typical USB hub. It works alongside your existing wireless network to let you share up to five USB devices like printers and external hard drives. A print server that's simple to set up is the highlight of the package. The $119 Firestick Pico from Yoggie Security Systems is roughly the size of a typical USB flash drive, but it houses a sophisticated firewall that runs on a mini 300MHz Linux-based computer. It comes with a copy of Kaspersky Anti-Virus and is especially handy for laptop users who log on in un-secured wireless hot spots. When it comes to USB devices, storage is big. In the case of the Toshiba 320GB USB 2.0 Portable External Hard Drive, it's abso-lutely huge--in capacity, that is. The $200 drive weighs just 6 ounces, but the impressive capacity is enough to sock away tons of data, back up multiple computers or take some heavy-duty media files with you on the road. USB thumb drives are prolific and make for handy storage options. The $137 8GB Kingston DataTraveler 400 includes MigoSync data synchronization software to help you organize your data between multiple PCs. The $59.99 4GB SanDisk Cruzer Titanium Plus comes with six months of free online backup for the drive. A subscription fee of $29.99 per year applies after that. For demanding environments, the $250 Corsair Flash Survivor is a 32GB flash drive in a waterproof aluminum casing. A mouse is a very personal thing; it's important to find one that is both comfortable and capable. The Targus Wireless Laser Stow-n-Go Laptop Mouse is a 4-ounce portable mouse with power conservation capabilities that provide up to six months of battery life. It features laser technology for accurate tracking, and the USB wireless receiver stows away in the mouse for portability. The $34.99 Kensington Ci75m Wireless Notebook Mouse works wired and wirelessly. Its slim design hides a clever built-in USB cable for when your battery dies or if you're computing in a place with restrictions on wireless usage. Few things are more frustrating than having your AAA battery-powered portable Bluetooth mouse die in the middle of a computing session. The Energizer DUO Charger will recharge your AA or AAA batteries from a USB port or from a removable wall plug. It takes about two hours to recharge two AAA batteries. A downloadable program from the Energizer website can show you where your batteries are in the charge cycle. Go ahead and fire up your USB fondue pot and invest in a USB hub. You'll probably need to add extra ports to your computer to handle all your USB-equipped business gadgets.